In the excellent book The Geometry of Musical Rhythm – What Makes a ‘Good’ Rhythm Good? by Godfried T.Toussaint, there is an interesting discussion of Rhythmic Oddity in Chapter 15. A rhythm has this property if no two of its onsets divide the rhythmic cycle into two half-cycles, that is, two segments of equal duration. This property of rhythmic oddity applies only to rhythms that have an even number of pulses. The sequences (1 1 1 0), (1 0 0 1 0 0 1 0 0 1 0 0) do not satisfy this property, where as the sequence (1 0 1 0 0 1 0 0) satisfies it. Godfried explains how the Hop and Jump algorithm can generate a rhythmically odd rhythm for a given total number of pulses and number of onsets (provided a solution exists). 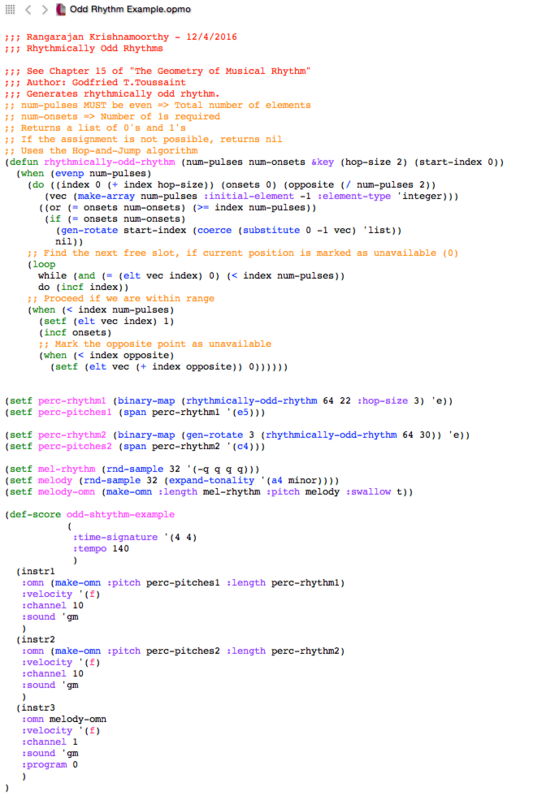 Piqued by curiosity, I decided to implement the algorithm and test it in Opusmodus.